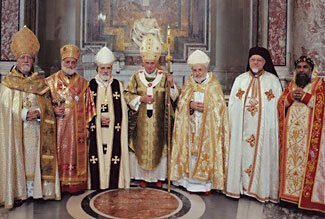 Sometimes it is as little as dress that distinguishes different denominations, sometimes there are much more significant differences. One of the most distinctive elements of the Christian faith is that it is so fragmented. Depending on how you choose to count, some sources suggest there may be as many as 50,000 different Christian organizations (some use the term denominations) at present, all being groups who consider themselves Christian. The count is increasing very quickly. Here’s one of many counts and analyses and here’s another. This discussion is helpful, because it points out a valid distinction between “independent churches” and differences in belief. However, to try and reduce the count of denominations avoids addressing the remaining large mystery – why would two (or two hundred) churches with identical beliefs choose to be independent of each other, rather than unite in their shared faith? Compare this to Islam, which seems like it might have about 30 different branches and ‘schools of thought’. There are a similar number of branches of Hinduism, and possibly a similar number of different approaches to Buddhism. It may be possible to do similar math with these other religions and create larger counts, but this is irrelevant. The big question we seek an answer to is why are so many churches independently ‘rediscovering the wheel’ rather than moving forward in unison? To put these numbers in further context, there are approximately 2.4 billion Christians in the world, 1.8 billion Muslims, 1.2 billion Hindus and 520 million Buddhists. Not only is the number of different Christian denominations extraordinarily large, but the rate at which new denominations are appearing seems to be rapidly growing, and currently almost 1,000 new denominations are being recorded every year. This fragmentation is completely the opposite of what one would expect (and hope for). It is possible to understand how in the early days of the Christian church, with imperfect communications and contact between churches, and with inaccurate and varied Bible translations, differences could arise, much the same way that language dialect evolved. But now we have brilliant communication, excellent scholarship, and an abundance of high quality Bible translations and interpretive tools. It is also organizationally easier for groups in different locations to join together and to share common resources (a common website, for example, plus common naming conventions, images and branding, and so on). Mail is fast and reliable, phone calls are close to free, and email/texting binds us all totally to each other, should we so choose. Shouldn’t this help us rediscover a consensus of opinion, and start merging together? In organizational terms, we all report to the same “CEO” and “Chairman”. Just like how the number of regional dialects is massively reducing due to better communications (indeed, the same is true of distinct languages too), surely we should see the same with our denominations. Other businesses are ‘rationalizing’ and reducing in number – sure, there may still be the same number of convenience stores (or whatever else) open, but more and more of them have the same brand on their storefronts. There are more flights to more places and more people traveling than ever before, but fewer and fewer airlines. And so on, in countless other scenarios and examples. But we see the opposite when it comes to Christian churches. More and more distinct/separate/different churches. Our major denominations continue to talk about uniting in some form or another, but nothing ever happens, and the minor denominations (yes, including even us!) continue to appear. Are Many Churches a Good or Bad Thing? To be clear, we do not think the fragmentation of our faith and following is a good thing. Would not our fellowship, and our strength of purpose, be so much greater if we were surrounded not by vaguely perceived as ‘similar sort-of Christians’ who worship elsewhere, and slightly differently, instead but by our friends and neighbors walking proudly on the same path as we do, ourselves. Who among us can not confess to sometimes being slightly irked by seeing other groups with larger and more impressive church buildings, and larger congregations, while also having a sense of pride when seeing an impressive building that belongs to ‘our’ church. And who doesn’t fear that sometimes our church leaders feel a sense of competition between each other, and that church growth is sometimes more focused on competing for the same church-goers rather than outwardly seeking to create new believers and welcome them into any church community. Our point is simply that surely we should be encouraging an amalgamation of churches. Is there really that much difference between your church and the church located a block away? Are there ways that you both could work together, for greater efficiency, to provide more services at lower costs? If you each can really only afford to pay for half of a resource, and so have either no resource at all, or an inadequate but still expensive one, couldn’t you pool your resources and acquire one good resource and share it fairly? This ‘resource’ could be anything from another employee to a church bus to shared advertising and promotion. In some areas, churches are struggling to keep their doors open, with smaller congregations and less financial support. Why continue to struggle? Why not unite with another nearby church, and become a single and strong successful church. To look at this from a different perspective, if your church is flourishing and has no shortage of resources and funding, wouldn’t it be appropriate to share your blessed abundance with other churches that are not so fortunate. And, for a very direct question, to church members and their leadership : What is stopping you from joining with other churches, both locally and further afield? Search your hearts – is it possibly personal vanity? Ask your church leaders in particular – why are they unwilling to bring your church and other churches together? And, lastly, the most relevant question of all. In what way can you best serve God? Separately, or together? 10 I appeal to you, brothers, by the name of our Lord Jesus Christ, that all of you agree, and that there be no divisions among you, but that you be united in the same mind and the same judgment. 11 For it has been reported to me by Chloe’s people that there is quarreling among you, my brothers. This concept is echoed elsewhere too, of course, for example Matthew 12:25 and Romans 16:17. Outsiders look at us and laugh, saying (or at least thinking) “If you can’t even decide on what it takes to be a Christian yourselves, how can I ever be expected to know what is right and wrong and how to become a Christian?”. Who hasn’t heard a non-believer shrug off our message of Christian salvation with the one-liner “How can I believe the Bible when it is so full of contradictions” – and aren’t we ourselves proof of that, showing that we Christians can’t even ourselves agree on what it says! Imagine if, prior to sitting a major exam, there were a bunch of people around the entrance to the exam room, all offering to give you, for free, a copy of the answers. But each person was offering a different set of answers. What would you do? You’d probably ignore them all and just go into the room and do the best you could. Division makes no sense, either from a Biblical or a secular perspective. A drive to unity will help us all focus on what is really important, and help us to understand what really actually isn’t all that important at all – and also, that which is just plain wrong (1 Corinthians 11:19).